Been thinking about how your kids can enjoy camping with their own bunk bed while you have your own queen bed? You might even choose a Murphy bed option instead. 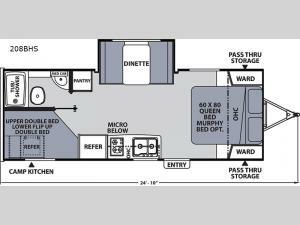 This Apex Nano 208BHS also provides a slide out booth dinette for inside dining, a camp kitchen for outdoor cooking, and a full bathroom for convenience where ever you decide to stay. You can store your fishing gear and outdoor chairs in the pass-through compartment, and hitch up and head out for a weekend or longer vacation. Choose this model today!